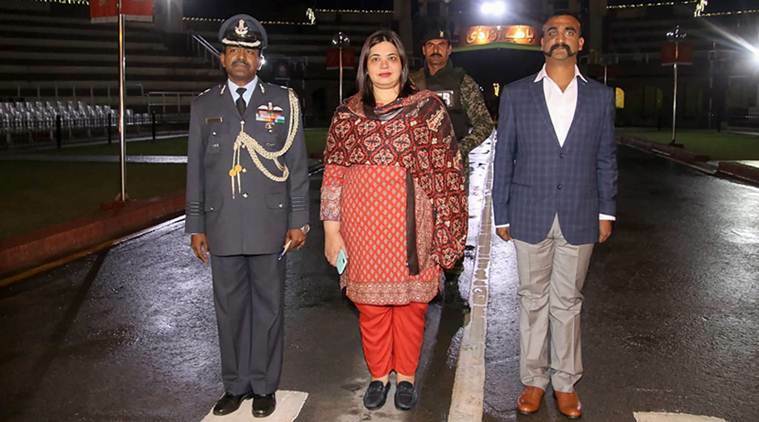 Amritsar, March 1: Indian Air Force (IAF) Wing Commander Abhinandan Varthaman returned to India from Pakistan via Attari-Wagah Border on Friday. The IAF officer crossed over to the Indian side with a smile on his face. The IAF pilot’s return came two days after he was taken into custody by Pakistan Army following the crash of his MiG-21 Bison aircraft. Before being hit, he shot down a Pakistani F-16 while it tried to violate Indian airspace. Wing Commander Varthaman was received by Border Security Force (BSF) and IAF officials. He was brought back by Pakistani Rangers in a convoy. After undergoing a medical check-up, it is being reported that Wing Commander Abhinandan Varthaman will be taken from the Attari Border to Delhi where he will go through a debriefing session. Pakistan Court Rejects Plea to Stop Indian Pilot Abhinandan Varthaman’s Release. IAF Wing Commander #AbhinandanVarthaman at Wagah-Attari border, to cross border soon to enter India. WC Abhinandan Varthaman was taken into custody on February 27, a day after the IAF carried out a strike at Jaish-e-Mohammed (JeM) terror camps in Pakistan’s Balakot. On Feb 27, PAF’s f-16 jets tried to enter into the Indian airspace following which the IAF’s Mig-21, Sukhoi 30 MKI and Mirage 2000 fighters planes were pressed into combat operation to chase away the Pakistani jets. IAF Pilot Abhinandan Shot Down Pak F-16 before His MiG-21 Bison Was Hit. IAF Wing Commander Abhinandan Varthaman Returns to India; Here’s How PM Narendra Modi, Punjab CM Captain Amarinder Singh Reacted. Wg Cdr Varthaman’s parachute landed on the other side of the border and the IAF pilot was taken into custody by Pakistani Army. after which it released photos and videos by the Indian pilot, thereby violating the Geneva Convention. The rules of the Geneva Convention restricts countries from putting out pictures and videos of prisoners of war.